To a traveler, looking at a globe or a map is like looking at a teasing promise of great adventures to come. Whether you are on a grand adventure, or stuck working your 9 to 5 office job, keeping one of these accessories around might just make you feel a little bit better. 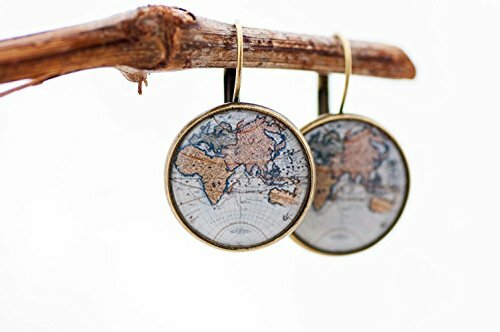 At the very least, these Globe and Map themed accessories will let everyone know that your heart was made for wandering the planet! 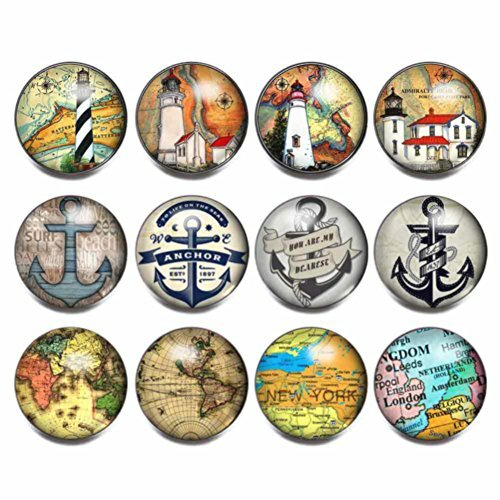 These globe and map themed accessories are so much fun. Whether you head out on a new adventure soon or stick close to home, remembering your love of adventure is always a good thing to do! This pretty Stainless Steel dog tag has a 3D engraved design that seems to sparkle like a diamond. The high polish silver chrome really catches the eye, making it a unique and fun necklace when worn on the 36″ metal chain it comes with. But if you aren’t into dog tags around your neck, it makes a great keychain or luggage tag, too! 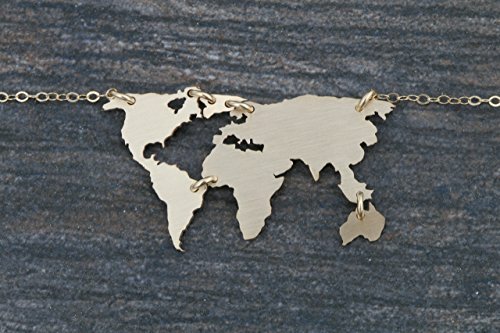 This beautiful and handmade necklace offers a stylized view of the continents of our planet. Available in either silver or gold, it is a lovely gift for a woman who enjoys traveling. The Silver Option necklace is hand crafted from 22 Gauge 935 Argentium Sterling Silver, which contains for silver than 925 Sterling. Germanium is also added to make it more tarnish resistant. The Gold Option necklace is hand crafted from 14K Gold. The necklace also comes with a matching chain. 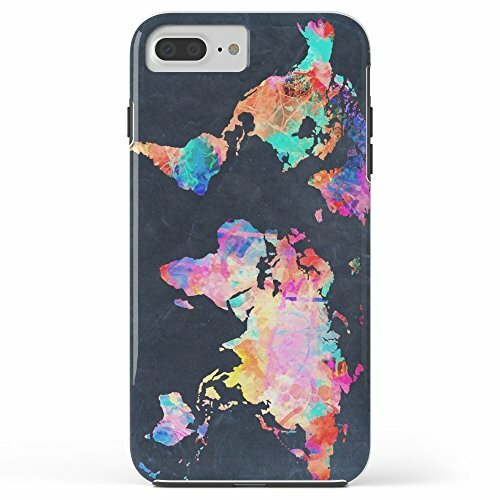 This World Map Rubber case is made to fit T-Mobile, AT&T, Verison, Sprint, iPhone 7 PLUS. Unique and fun, the case allows full access to all buttons, ports, cameras, and flash. The beautiful map design is printed onto the metal on the back of the case. Not a decal or a skin, this design is built to last, offering stylish protection for your phone! 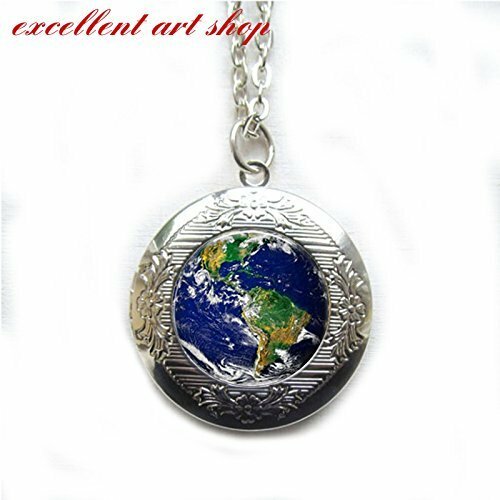 This beautiful globe pendant is very eye catching. It comes with a matching chain so you can wear it right away. The price is more than affordable. It makes a great gift and a welcome addition to any wardrobe! OK so this isn’t a map or a globe but it’s still inspiration to get traveling! This lunch bag easily stores a sandwich, chips, and a small drink. My favorite thing about it is, well everything! You may be sitting in the break room for lunch, but with a bag like this, your mind is encouraged to dream big dreams! Warning: This bag could make it challenging to get back to work when your lunch is over. This cool laptop back measures 15.75″ wide and 11.22″ high. It is designed to fit any laptop or notebook computer. It is made of light-weight and water resistant neoprene, and has a thick padded edge for added protection. 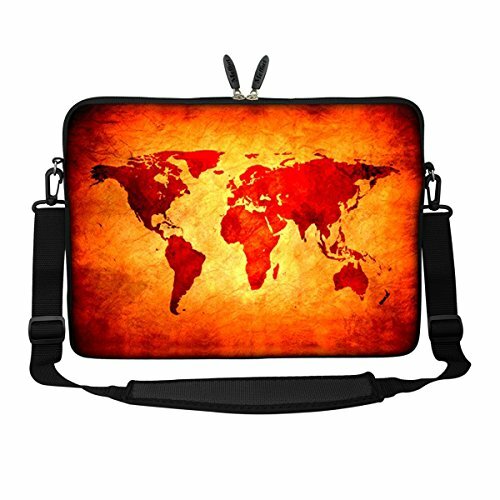 Your laptop allows your mind to travel, so why not keep it in a bag that encourages you to dream of traveling around the world, as well? This set of 12 charms lets you embellish your own clothing with a travel style. The snap buttons are perfect to remake a shirt or finish a purse. Your imagination is the limit. 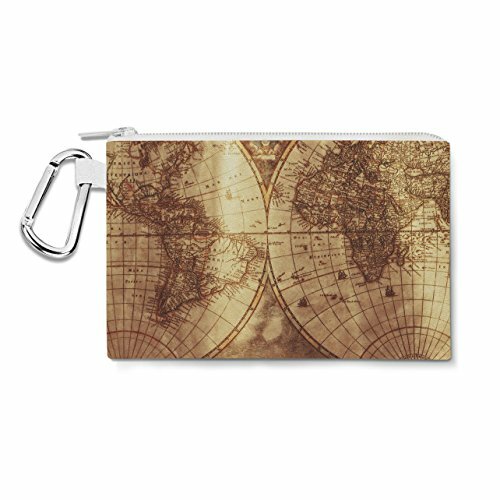 Available in six sizes, this globe printed zipper bag is ready to help you keep all the things organized. It comes with a zipped closure and a mini carabiner that makes it a snap to attach your bag to just about anything. Whether you use it for your pencils and pens, small craft items, makeup, or something completely different, this classy bag is ready to to be put to work! 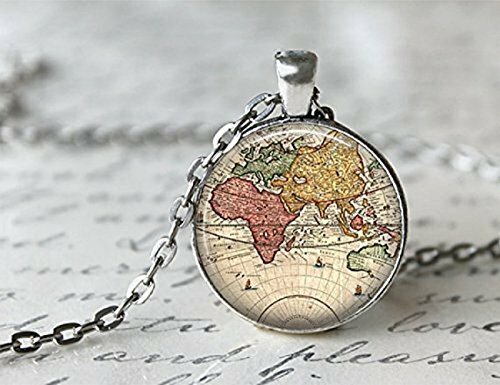 If you love lockets, this is the necklace is one of the best globe and map themed accessories for you! The image of continents against the blue sea combined with the glimmering silver frame is lovely and eye-catching. Keep treasured pictures inside, knowing that no matter where your travels take you, your treasured ones are close to your heart! These dangle earrings are antique bronze in color. Unique and hand made, they feature the image of an old atlas map. Light and comfortable, they measure 20 mm in diameter. They are nickel free and lead free, and make the perfect gift for anyone who loves exploring the world. 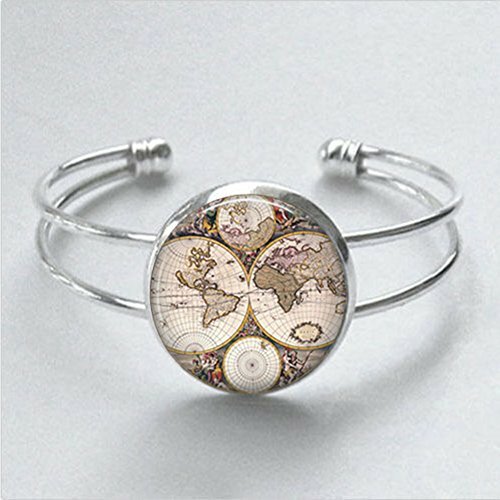 Now you can wear a beautiful globe around your wrist! 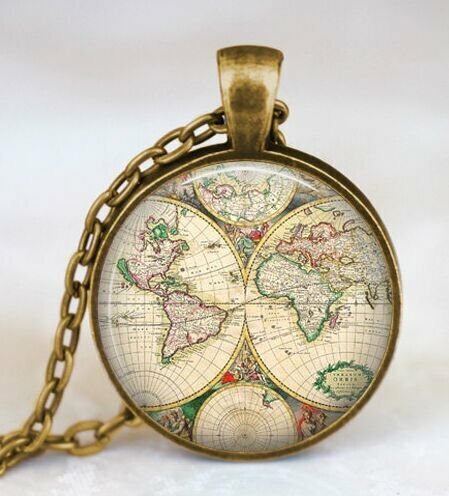 This beautiful vintage atlas image is complimented by the delicate silver of the jewelry. Easy to fit to the unique shape of your own wrist, this lovely bracelet allows you to carry the world around with you, providing lots of opportunities to dream of travel! 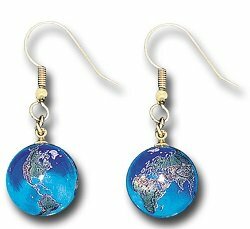 Made from transparent Blue Art Glass Marbles that measure 1/2 an inch across, these pretty earrings put our big blue ball right on your earlobes. Fitted with gold fill pierced earring findings, they offer incredible detail and beauty. The best part of all is that a portion of each sale goes to environmental and peace organizations. Dream of traveling the world while helping to take care of it along the way! 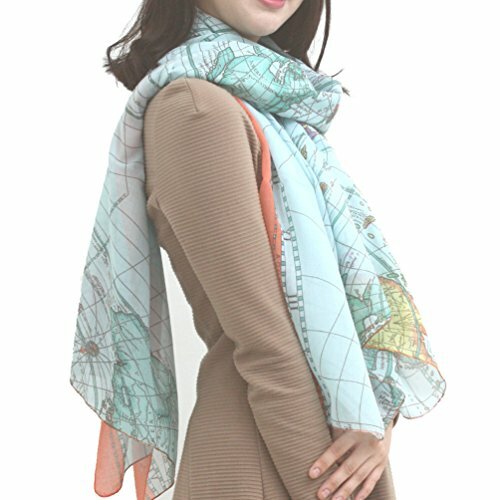 Soft, flowing, and elegant, this map printed scarf is made in Korea. Light blue and other soft tones make it a great accompaniment to many of your favorite outfits. 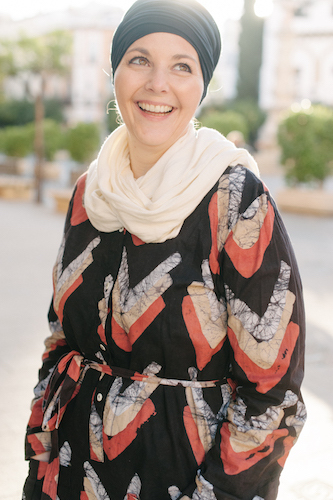 Scarf measures 40 X 70, giving you lots of fabric to work with as you accessorize. Add a splash of color – and dreams of travel – to all of your favorite outfits! 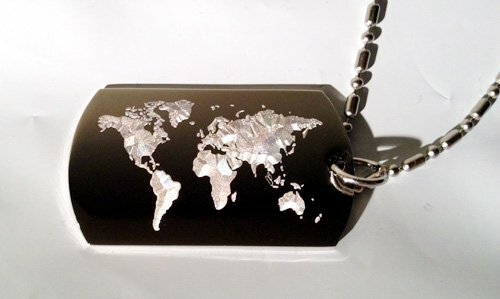 This beautiful world map pendant is handmade! Choose from three different colors – silver, copper, or antique brass. Each color comes with a 24″ inch chain. This jewelry is water resistant and comes in a jewelry box. It’s ready to wear or to gift to your favorite wandering soul!